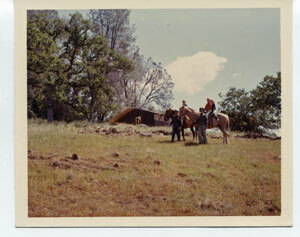 Before we bought the boat and sailed off into the wild, blue yonder, we lived on a rustic ranch in northern California. We lived like pioneers without running water, electricity or a telephone. Paradise, California is a small cowboy and old gold rush town in Butte County, near Chico. We headed slowly through the gate and drove onto the sixty-three acre property. Golden swaying grass covered the earth as far as I could see. Old oaks grew together in groups across the landscape, along with red Manzanitas, small shrubs, and an occasional tall green pine. The gravel road crunched under our wheels and led us through a wooded section. The road took a steep dive down through another wooded section into a larger open area that looked south over a large valley. As we traveled down the road, I was amazed to see buildings. We’d all expected land in the middle of nowhere – just like Dad described to us, but he had not said anything about the work he’d done. He kept turning around to check our faces to see how surprised we were, obviously proud of himself. “That’s the barn, where we keep the horses and goats,” he said as he pointed to an A-frame building on the right with bales of hay next to it. All three of us jumped up on our knees to get a closer look. “We have horses?” Monica squealed. “Yes, girls, I wanted to surprise you. The goats are ours but the horses are just boarded here for a friend in town.” I looked but couldn’t see any animals. The car rolled forward slowly and Dad continued on with his tour: “And that’s the foundation of our new house.” He parked the car next to an old gray International truck. We all scrambled out of the car excited to see except Mom, who daintily opened her door and stood up gingerly. The cement pad was near the edge of the canyon. “Isn’t the valley beautiful?” Dad said. The view was immense, and the canyon below very steep. A patch of green trees ran along the canyon floor, proof of a river down there. I couldn’t wait to hike down and taste the water. As we stood on the foundation, Dad showed us where the bedrooms, kitchen, and big deck would go when the house was finished. I turned around to find Mom standing by the car staring in the opposite direction, past the barn to a little trailer we had passed that was parked under a massive oak tree. Before Mom said anything, Karen asked, “What’s that cute little house over therrre?” pointing to a much smaller A-frame structure built to match the barn, behind the foundation, up against the hill. I whirled around to see it. I squinted my eyes and looked at my sisters, who also looked puzzled. I looked back at Mom. She turned to look at the outhouse, shielding her eyes from the sun with her hand. “I will not Bjorn,” was all she said and marched back to the car and sat down inside. Monica, Karen, and I raced to look inside the cute little house with its A-framed roof. Dad watched it all from the foundation. From the passenger’s seat Mom yelled, “And what’s that little trailer over there?” But Dad ignored her and walked to the outhouse. Monica opened the spring-loaded door slowly. We leaned in to see the darkened space, hoping not to see anything gross. What we saw was a wooden shelf with a toilet seat in the middle. It looked new and unused and smelled like fresh pine. I yelled to Mom, “It smells good! Come here! It smells good!” But she didn’t hear me; she seemed to be studying the grand view from her seat in the car. Done with exploring the outhouse, Monica ran toward the barn to find the animals, her long skinny legs flying like a gazelle’s. Karen and I followed her, running as fast as we could to catch up, as Dad walked behind us. As we passed the car where Mom was sitting, she got out and slowly followed us. When we got to the barn we discovered that it not only looked like the outhouse, but smelled exactly like it too: fresh pine. “When can we see them? When can we ride them?” Monica yelled to Dad as he approached the barn, unable to contain her excitement. “Out grazing on the property,” Dad answered. “And the goats?” Karen asked. “They’re probably with the horses. They usually stick to together,” Dad said. Inside the barn were two stalls for Charlie and Duke to spend the night, and a tack area where saddles and reins hung neatly on nails. Hanging on another nail was Dad’s dark brown leather floppy hat. The heat hung over the barn, making the smells of hay and pine pungent in our noses. Dad took off his shirt, tossed it to me with a wink, and put on his floppy leather hat, ready to begin work. He had that special relaxed smile on his face and I could tell he was happy and my heart just about burst out of my chest from the excitement of it all. Under the barn was an enclosed pen for the goats to sleep at night, “to keep them away from the coyotes and mountain lions,” Dad warned. The exhilaration of our new home and the fear of living with wild animals mixed together inside and made my heart pound. Life was always exciting with Dad. 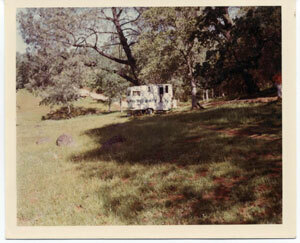 We ran to the white trailer next as Dad followed us smiling and watching us discover the property. Mom had wandered down the road toward the trailer, “Ah, Bjorn, you’re kidding right? We can’t all fit inside this, can we?” The miniature trailer looked like Ken and Barbie would be happy in it, but not a family of five. I ran back down the gravel road with my arms in the air screaming, “Midgaard I love you! Midgaard I love you!” Karen and Monica followed me and joined in yelling to the world how much we loved Midgaard.